The 11th Annual Fall Summit, held at Saint John’s University this year, engaged over 200 students and coaches from 14 Youth Energy Summit (YES!) teams from central and southern Minnesota. Students participated in sessions like “Get Current,” “The Climate is Changing, Are you?,” “You Are My Sunshine,” “Water, Water, Everywhere, We Really Need to Care,” “Waste Not,” and “Pushing Your Limits” that connected them with peers, engaged them in tools for success, and demonstrated project ideas as they head into the 2017-18 YES! season. The theme for this year’s Fall Summit was “Say YES! to Living Green.” YES! was fortunate to have multiple speakers on careers presenting on how they became successful in their environmental field. Two of the big highlights at the summit this year were the climbing wall and 34-foot Voyageur canoe from Prairie Woods Environmental Learning Center. YES! works hard to bring opportunities like these to its students at events to further engage them in hands on learning. YES! was also fortunate to have regional experts to assist with sessions. The Get Current! session (lead by Alexis Troschinetz from CERTs) was focused on energy conservation and devices that can assist with that effort. The Climate is Changing, Are You? session (lead by Jothsna Harris and Kira Liu from Climate Generation) focused on teaching students what it takes to put on a community event demonstrated by Climate Generations Climate Convening model. The Water, Water, Everywhere, We Really Need to Care session (lead by Jon Morales from the Middle Fork Crow Watershed District and Charlene Brooks from the Kandiyohi County Aquatic Invasive Species Task Force) had students next to the lake learning about shoreline health and reasons for unhealthy bodies of water. They also explored best management practices completed at St. Johns and around the region. The Waste Not session (lead by Doug Lien from Tri County Solid Waste) focused on how much waste the average lunchroom produces and ways to reduce lunchroom waste through better signage, composting and recycling. 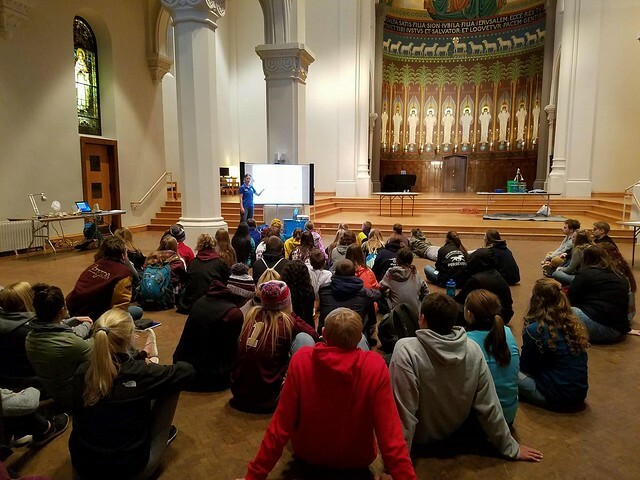 In the You Are My Sunshine session (lead by Eric Pasi from IPS Solar) students learned about how schools are getting involved in solar energy and explored Minnesota’s opportunities through the power of the sun. Students also learned about a cool new fundraiser opportunity through CERTs called Saving Watts and Drops that partners groups with their local utility to sell energy-efficient products to community members.